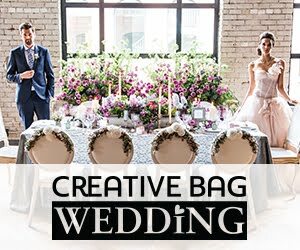 I've been inspired by some of the diy projects that I've pinning to my "restyled projects" board on pinterest and thought that I'd share one of my recent restyled projects with you. 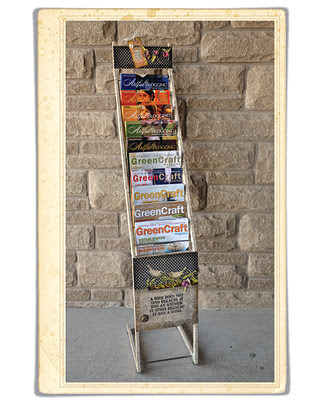 This upcycled magazine rack was a metal rack that my Mother-in-law "rescued" from the garbage at an electronics store ... I thought that I had some "before" pictures of this to show but I must have deleted them from my camera. 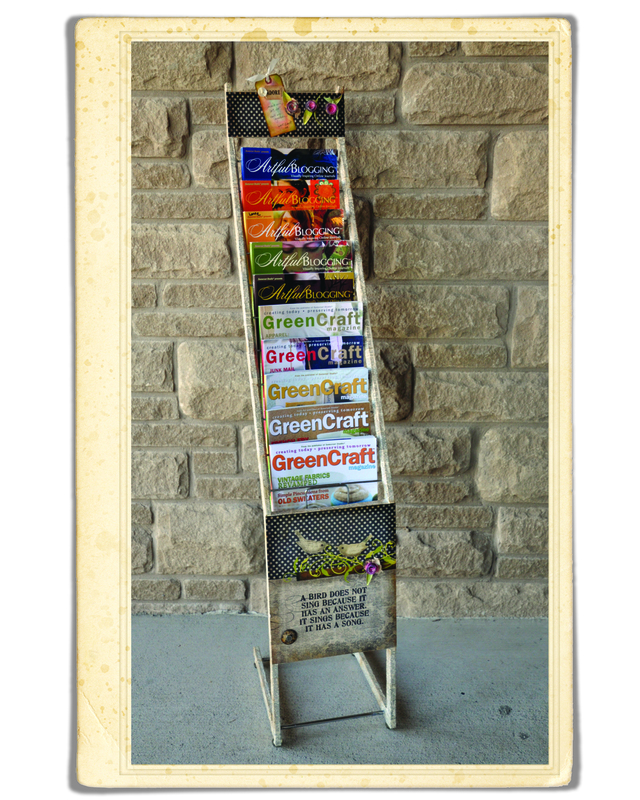 The metal rack was in good shape and I my Mother-in-law thought that she and Grandma would like to be able to use it in the kitchen to hold cooking magazines ... they just didn't like the advertising that was on the rack and thought that I could do something with it. 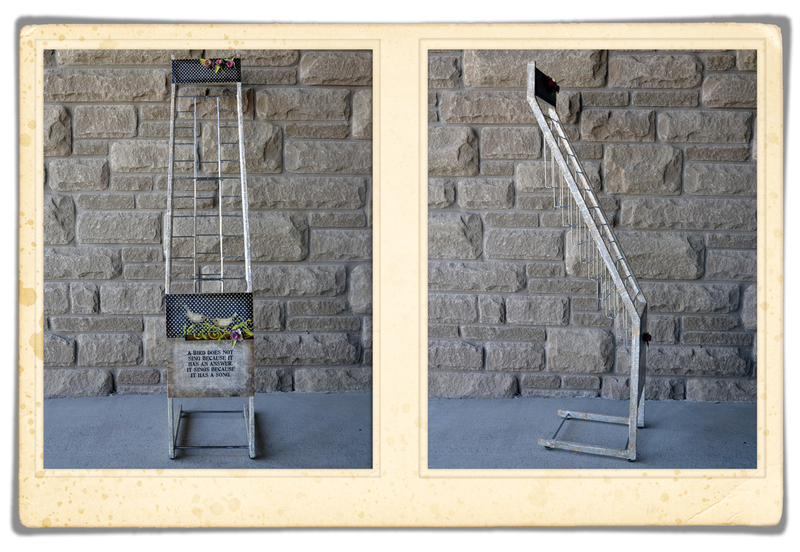 Here's the front and side views of the rack. 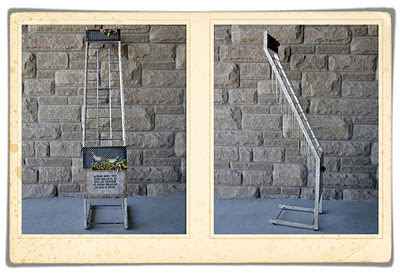 I covered everything that was originally painted black on the rack with pages from an old dictonary using gel medium. I didn't cover the silver/chrome parts because I thought that they looked fine. I antiqued the dictonary paper with distress inks (vintage photo) to give the piece an aged look. Here's a close up of the bottom front of the rack. I printed an art poster print at Costco and used gel medium to attach the poster to the front panels of the rack. 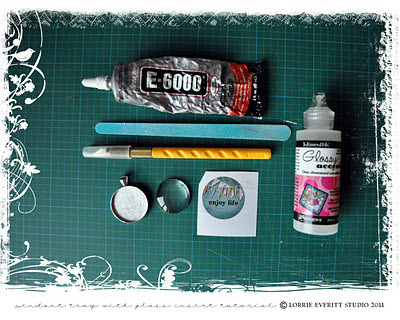 I distressed the poster using Tim Holtz distress inks so that it would blend into the dictonary papers on the sides. The collage art was created on my computer using my own digital elements and some digital scrapbooking papers that I purchased. I wanted the birds to stand out a little bit so I covered them with "glossy accents" by Inkessentials. 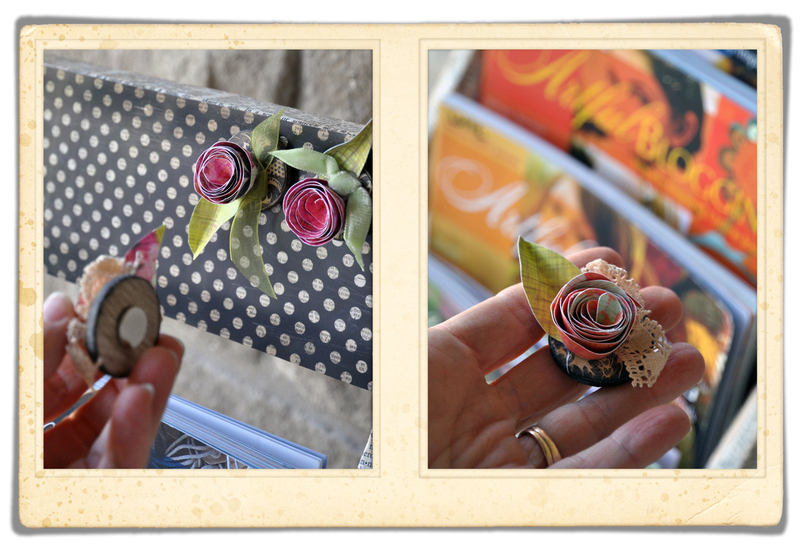 Because the rack was metal I thought that it would be cute to include some paper flower magnets. The magnets are decorative and functional. 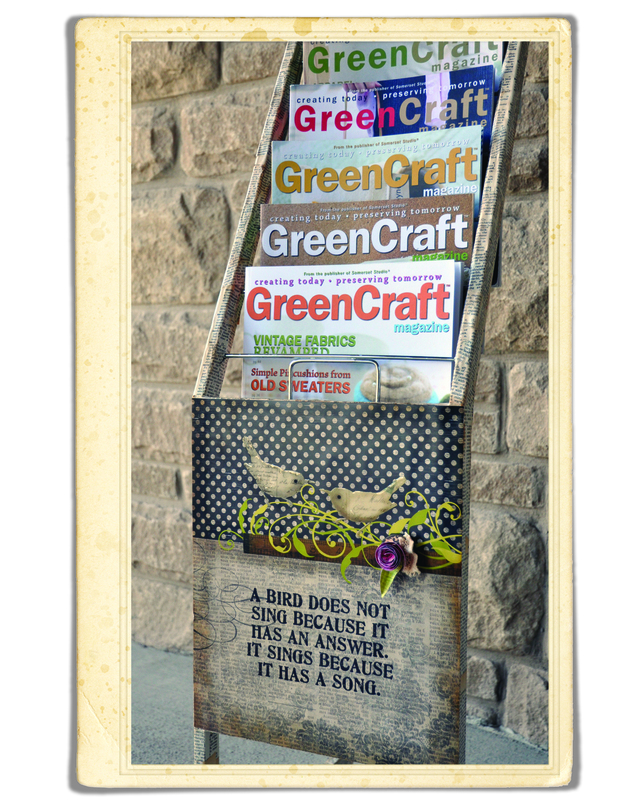 They display recipe cards and shopping lists. There are lots of great tutorials on how to make paper flowers online ... there are some on my pinterest boards if you want to try to make them yourself. I used gel medium to attach the paper flowers, paper leaves and some ribbon & lace scraps to wooden game pieces. FYI - my magnets of choice are rare earth magnets ... just keep them away from your computer and credit cards. 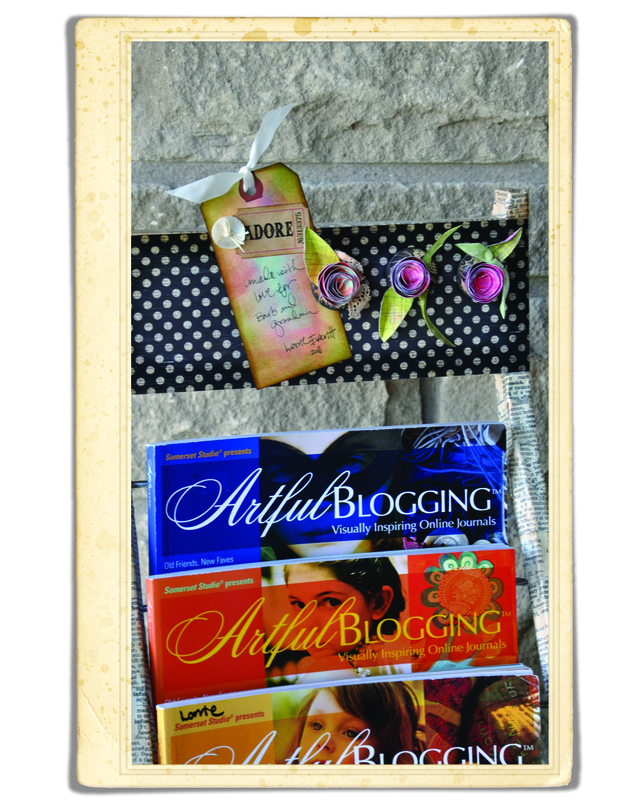 Here's one more shot showing the top of the rack with three of the magnets and the gift tag I attached. 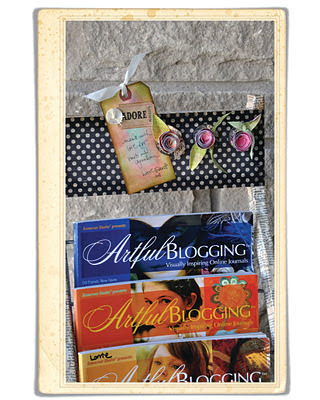 I have a couple of other restyled projects that I am just about finished that I will share with you next time! 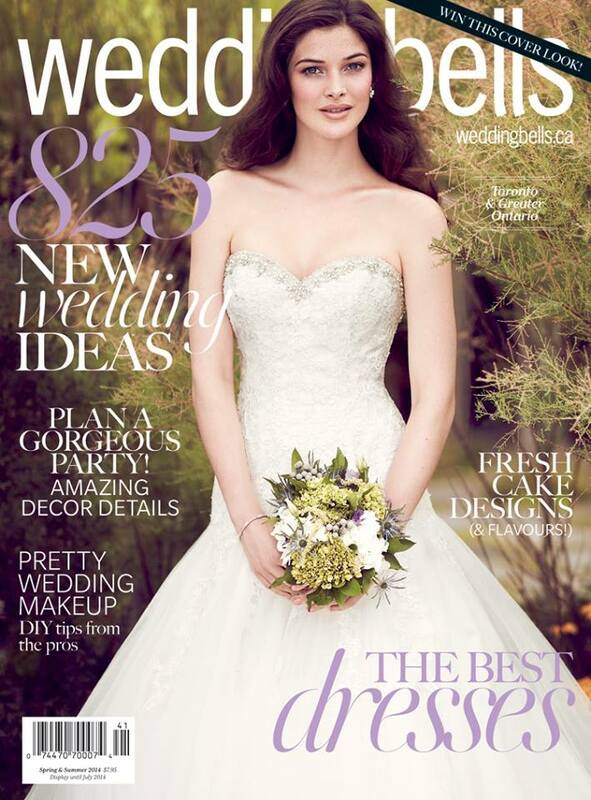 Are you working on any restyling projects for your home? If so, I'd love to know about them ... I'm always looking for new ideas to add to my pinterest boards. Happy crafting! I'm totally in love with pendant trays and glass inserts right now. There are so many different pendant tray shapes for necklaces, earrings and rings and don't even get me started on all of the different colours of metal. The vintage copper is my favourite at the moment. 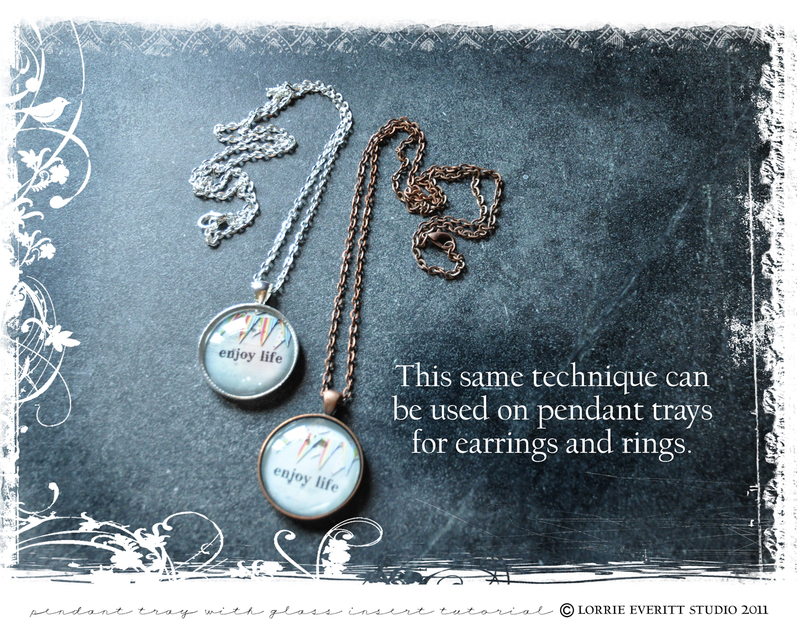 Here's a little tutorial on how to use the pendant trays and glass inserts to make your own jewellery! 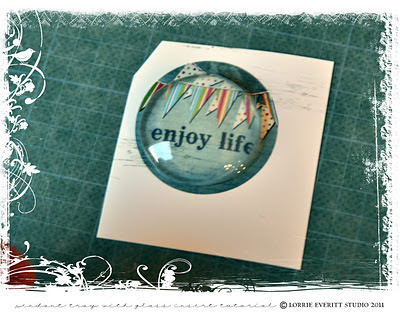 It is almost the same as my glass tile tutorial here but we do a couple of different things at the end. Let's gather our supplies first! 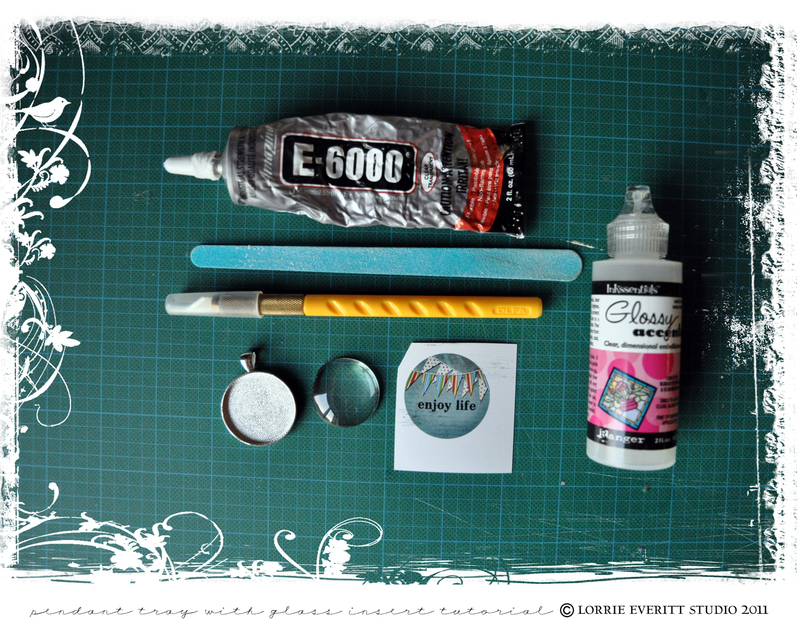 You will need a pendant tray and glass insert, something to use as art (I create my own digitally and print the jpeg file at Costco), glossy accents (or your favourite brand of diamond glaze), E-6000 glue, an xacto knife and small emery board. 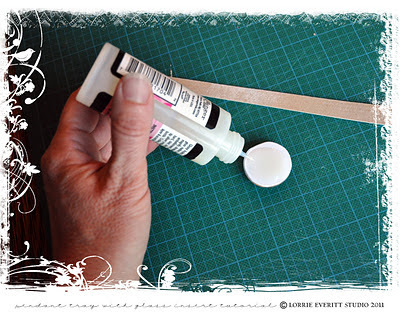 I work on a self healing matt and I use wax paper to protect the matt when I am using the diamond glaze or glue. The first step is to add a small amount of diamond glaze to the back of your glass insert. The back of the glass is the flat side if you have a puffy glass insert. You want to cover the entire back of the glass insert but do not add too much diamond glaze to cause it to drip down the sides. NOTE: You do not want any air bubbles in the diamond glaze so DO NOT shake the bottle (ever). I also suggest that you turn the bottle upside down before you start so that any air bubbles move to the top. 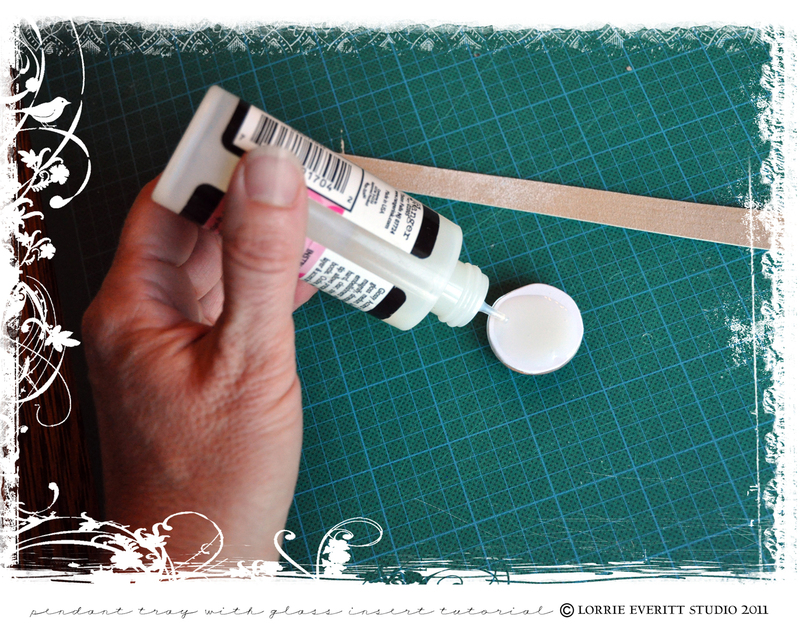 If your diamond glaze does not flow easily, use a pin to clear the tip. 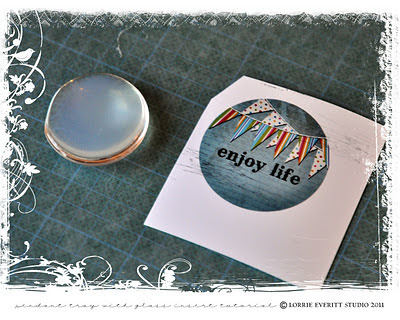 Next you are going to flip your glass insert over and place it on top of your art. Do not press down on the glass. You can gently slide the glass over the art to position it. It is important that you watch the positioning of your glass for the next 10 to 15 minutes to make sure that it does not slide while it is drying. The diamond glaze will take many hours to dry ... I usually start these at night and let them sit overnight before I start the next step. Once your piece is completely dry you are ready to cut the excess paper from the glass. Use an x-acto knife to cut around the shape of your glass insert. If you have any excess diamond glaze on the sides of the glass you can use the x-acto knife to scrap it off at this point. 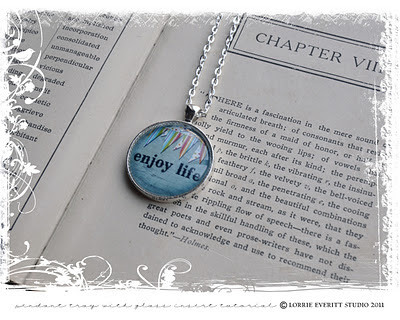 Then use your small emery board to sand any extra paper from the glass ... you can see more details on how to do that here in my glass charm tutorial. I like to add a thin coating of diamond glaze to the back of my glass tile at this point. No one will see it but I think that it protects the art. It doesn't need to be thick and don't worry if you have any air bubbles. Once this is dry (in a few hours) you are ready to add the glass insert to the pendant tray. 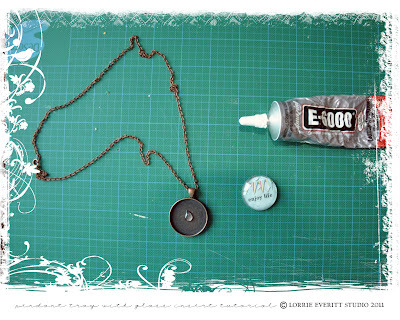 Apply a small dab of E-6000 glue to the centre of the pendant tray. Place your completed glass insert into the tray. Take some time to position your glass insert so that it is the way you want it to look and then press down on the glass insert. Leave your piece to dry for an hour or so. 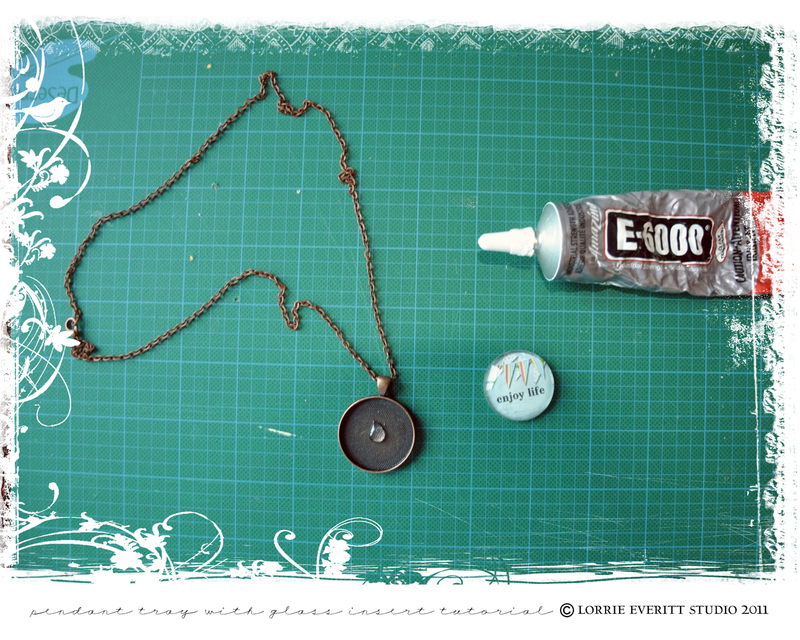 Once the E-6000 is dry you are ready to add a chain and wear your new necklace. 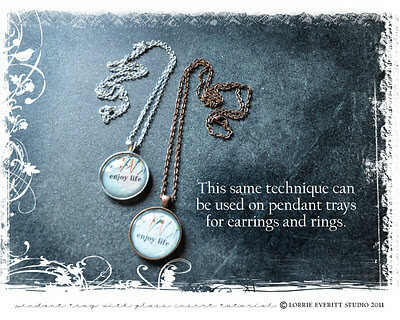 This same technique for the pendant trays works for earrings and rings as well. Again, this is another "additive" project ... once you make one everyone will want you to make one for them too ... which is fine because you will love making these and they make great gifts! 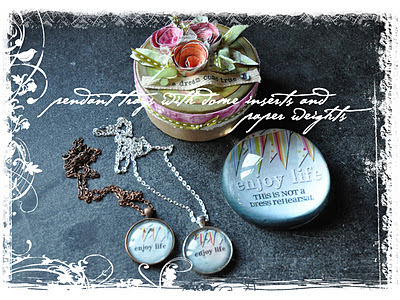 I have a bunch of these blank pendant tray kits for sale at Scrapbook Queens. 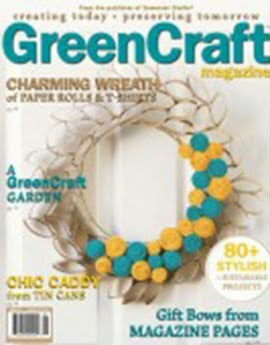 They are also sold in the jewellery section of better craft stores and of course at bead stores! I have been super busy this fall with lots of projects on the go. I just need to find some time to organize my photos and my thoughts so I can share a few of them with you. I feel like a kid in a candy store with some of my new jewellery findings. 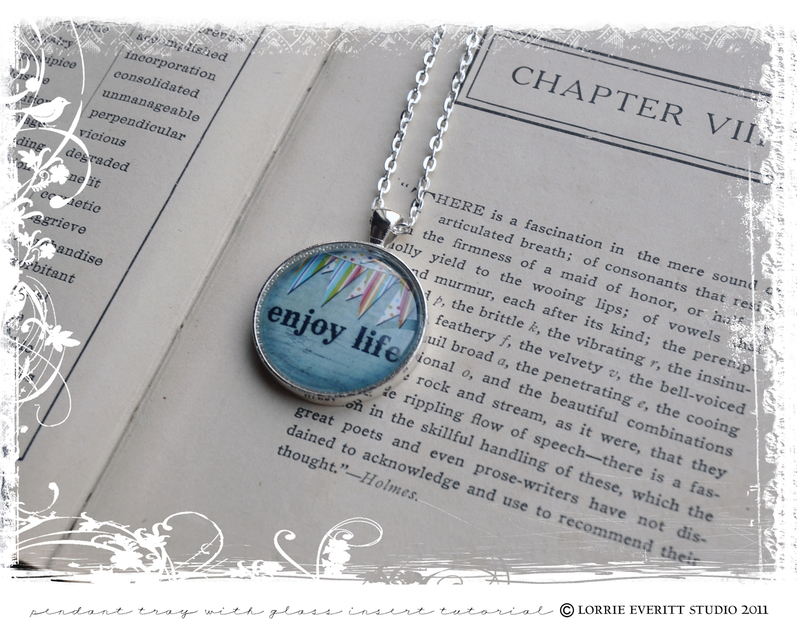 I'm especially excited about my new pendant trays for necklaces, earrings and rings. I've also got some amazing glass domes that are perfect for making your own paper weights ... I'm thinking teacher's gifts at the moment. 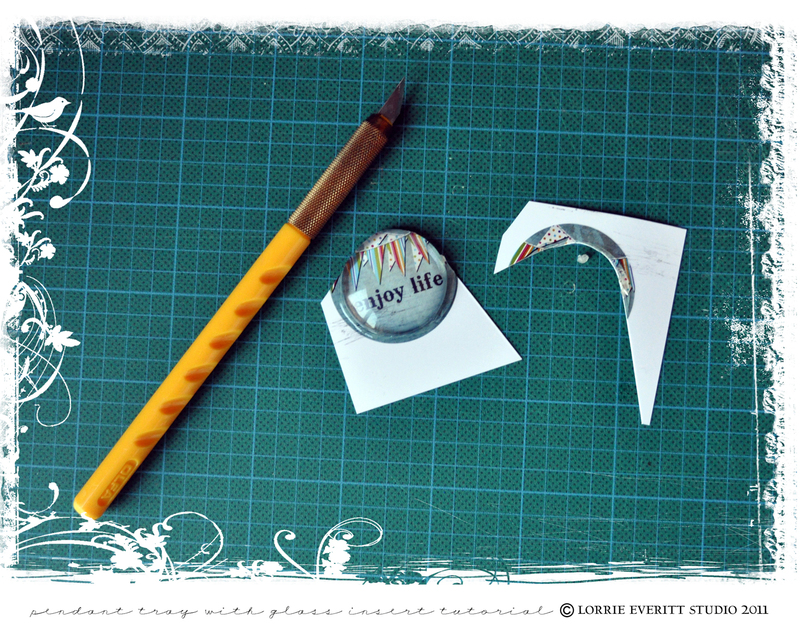 I'm putting together another little tutorial to show you how to use the pendant trays with the glass inserts ... I will post it later this week. 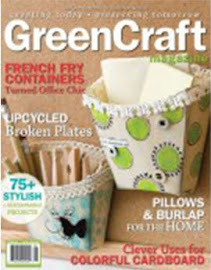 Scrapbook Queens has my new jewellery findings and glass domes in stock now. I'm also working on class projects using my jewellery findings and glass domes for holiday gift giving classes. 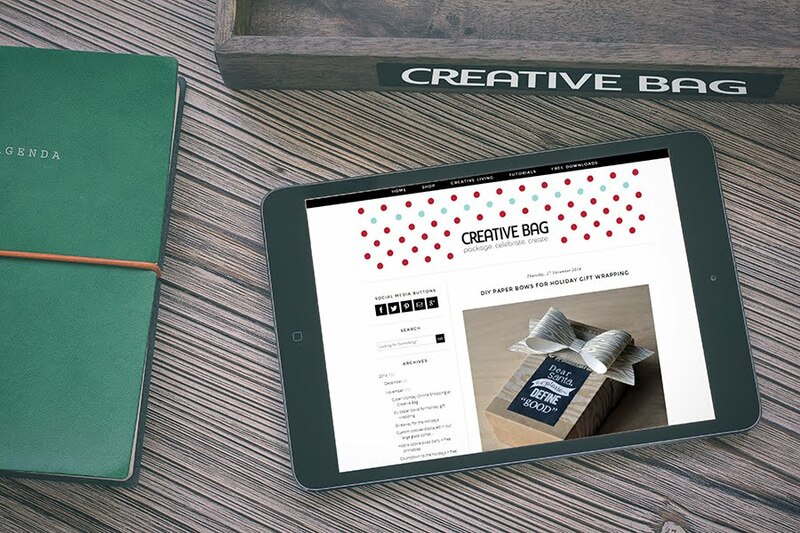 The glass domes make wonderful paper weights and I was thrilled to find the perfect box to hold my paper weights at Creative Bag. 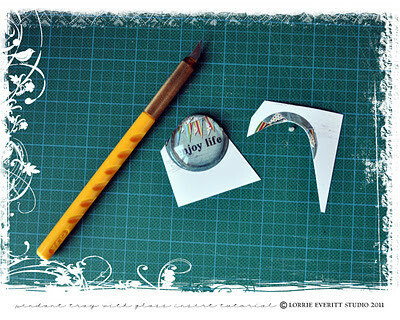 The picture above is a close up of my little gift box for the glass dome paper weight. 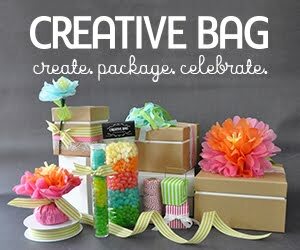 The small mod box from Creative Bag was plain ... so of course I had to make it my own with paper and ribbon scraps. 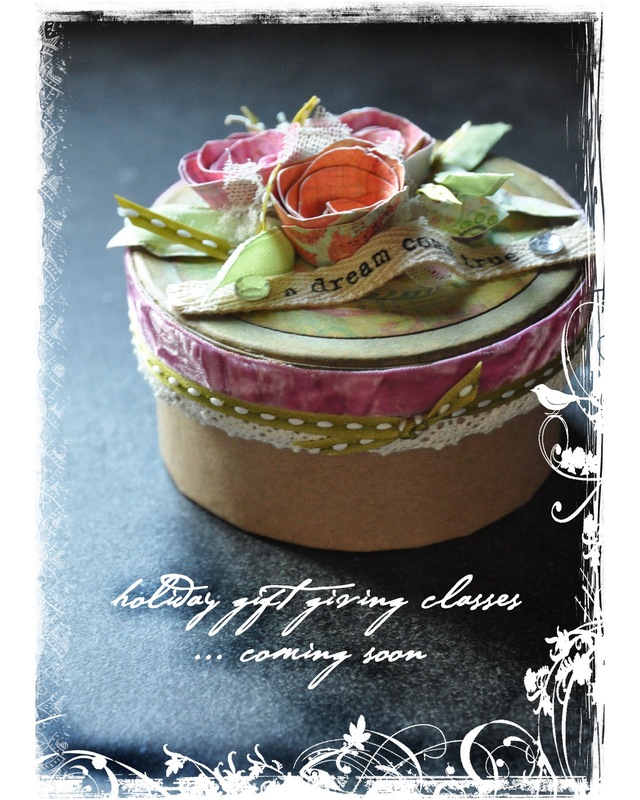 I think that I will have to include one of these gift boxes as a part of the paper weight class ... they were just too much fun to make. I'll let you know when my class projects and dates are finalized. You can see more information about my classes here . 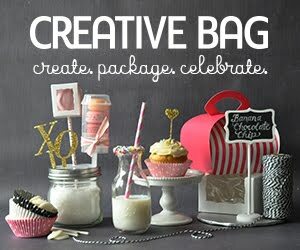 Hoping that you have a happy and creative week!